Driving your car, you notice something move across the windshield and cling to the wiper blade. To your surprise it's a lizard; holding on, head high, riding in the wind. Some messages from nature are more subtle than others. When they are not, you know it's a deliberate message for you. That's what happened yesterday on our way to lunch in Orange City. "Hold on," we told him, slowing down and stopping at the nearest nature spot we could find. I felt sad that he would be a long way from home, but we had no choice. Instead of being grateful for his reprieve, to our dismay he ran underneath the car. Having done our best, we asked the angels to watch over him. We had to let go of the outcome. A short time later while eating lunch at the Mexican restaurant, my attention was drawn to a gigantic century cactus outside our window. On a long thick frond, I spotted a lizard! It looked like our little hitch-hiker. When I told Elliot to look, the lizard's throat billowed in bright red as if saying "Thanks, here I am." A friend once told me that's a sign of love. The cactus was near our car and so we laughed, happy to see that he was safe. Lizard is symbolic of detachment. When under attack a lizard will snap off its own tail to fool his predator. This way he can make a quick get away before he gets swallowed up. The tail will eventually grow back, but in its wisdom lizard teaches that sometimes you have to lose your tail to get ahead. Lizard also teaches to let go of old fears. It can help us make a break from the past. It may indicate a need to explore new realms and to follow your own guidance before you get swallowed up in what's not beneficial for you. I thought the lizard energy was finished for the day, but to my surprise I saw a tiny baby lizard on the roof of our car as were were going out He was so adorable, looking up at me as I offered him a ride on a leaf. He jumped on willingly, but before I could lay it down he playfully scampered up my arm and then jumped into the grass. 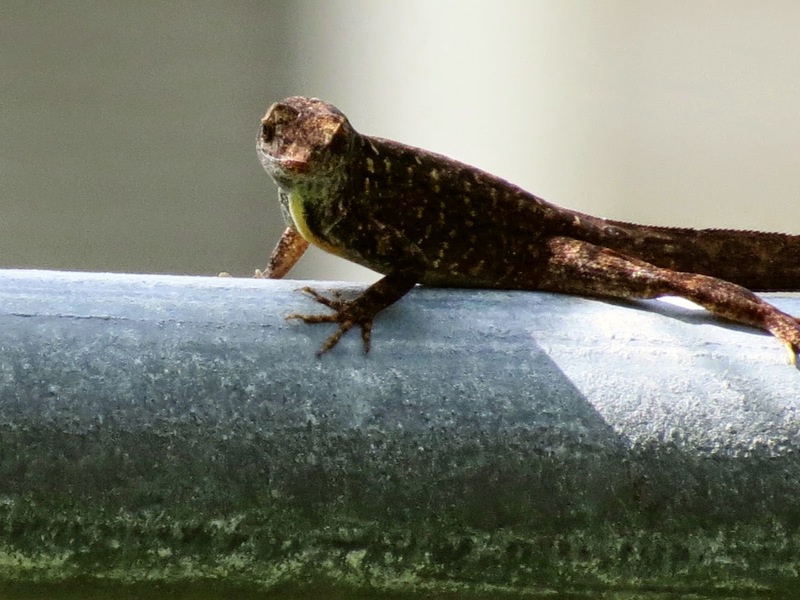 I was thankful that I'm no longer afraid of lizards (as I wrote in previous blogs) That's one fear they helped me get over. Love is always the answer. Love knows the way. Enjoy your day with the Angels. It's fun to pay attention to what nature may be trying to teach you.